A malfunctioning oil burner spread smoke and deadly carbon monoxide throughout a house with 12 people inside. Firefighters were first called to the scene at 0429 and found that the occupant of 12 Fossa Terrace had shut down his boiler after he believed it had malfunctioned. Upon further investigation, it was determined that the boiler for 10 Fossa Terrace (the second half of the duplex) was in fact malfunctioning and creating a hazardous condition in both living spaces. Deputy Chief William Walsh and his crews entered number 10, shut down the boiler and took readings to find out how much carbon monoxide was in the units. They found dangerously high levels of the gas and called for ambulances to respond to the scene. In total, ten of the twelve occupants were transported to Beverly Hospital for observation. The other two were evaluated at the scene but did not want to go to the hospital. Crews remained on scene until 0555 removing smoke and carbon monoxide from the homes. The owner of the property responded to the scene and was advised to replace smoke and carbon monoxide detectors in addition to having the boiler repaired. The fire, which damaged some shelves and a record collection was caused by careless disposal of smoking material. The occupant of the home dumped an ash tray into a trash barrel and left the room. A short while later he heard a crackling noise while in a room next door. He looked into the room, saw the fire and used a pot of water to partially extinguish it. There were no injuries as a result of the fire, but Northeast Regional Ambulance was called to the scene to check out the occupant. All units were clear of the scene by 0835. 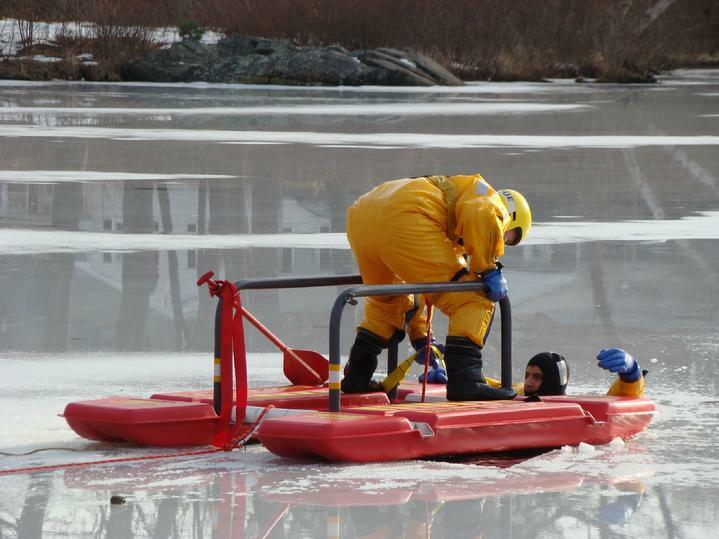 The Beverly Fire Department conducted Ice Training at Cummings Pond this week. This year the training included the use of a new piece of rescue equipment, the Arrive Alive Sled. The Arrive Alive Sled is a platform for a rescuer to approach and load a victim who has fallen through the ice and is unable to rescue him/her self. It allows the rescuer to remain on a stable work platform where they might have otherwise ended up in the water with the victim. The Topsfield Fire Department purchased the Arrive Alive Sled for the Beverly Fire Department with money awarded through the Assistance to Firefighters Grant. For years, the Beverly Fire Department has worked with various communities to provide training and rescue assistance through its Dive Team. The Topsfield Fire Department recognized an opportunity to provide both Departments with a piece of equipment that could save a life and was able to take advantage of it. Firefighters received training on the set up and use of the equipment when it was received but the January �thaw� provided an excellent opportunity to get firefighters out onto the ice and practice the skills they learned on the apparatus floor. The conditions were ideal for getting firefighters out onto the ice for the practical part of the training.